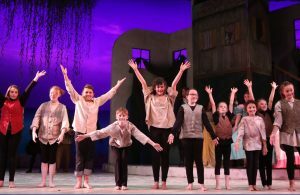 Broadway Rose contributes to the cultural growth and educational needs of the community by providing educational and creative musical theater opportunities for children and youth. Drama camps – Each summer we offer two exciting drama camps for children ages 8 – 12. The children experience all aspects of theater, from improvisation and theater games, to technical and performance skills. These skills are put to the test when the campers perform in the ensemble of one of the children’s theater productions. More info. 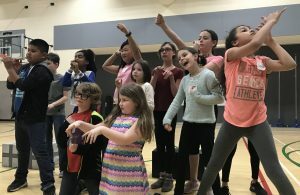 Spring Break Musical Theatre Camp — In this spring break musical theatre camp, students in 3rd, 4th, and 5th grade will gain theatrical experience in vocal harmonies and solos, basic choreography, character development, and more while gaining self-confidence as a performer and creating bonds with fellow students through team building exercises. More info. 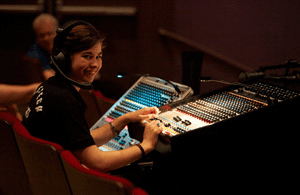 Teen Summer Workshop – Students ages 13 – 18, under the instruction and guidance of professional musical theater performers and educators, rehearse and present a fully staged musical each summer. More info. Technical Internships – One of our most successful programs, high school and college-aged student technical internships are designed to create and facilitate relationships between theatre professionals and students in order to train, encourage, and nurture those seeking careers or desiring to expand their expertise in theatre. Internships are paid positions. More info. 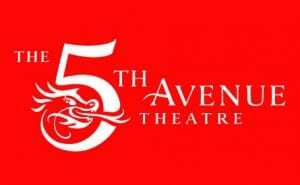 5th Avenue Educational Musical — Each spring our friends at 5th Avenue Theatre in Seattle create an original educational musical that tours throughout the region, performing in school auditoriums and cafeterias. 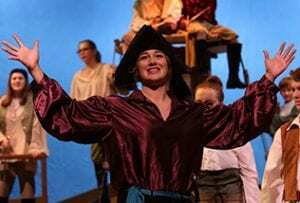 Over 3,500 elementary students in the Tigard-Tualatin School District experience this performance for free because Broadway Rose underwrites the performance expenses. Student Program Art—Broadway Rose hosts an annual contest for children at a local elementary school in conjunction with the Tigard-Tualatin School District Art Literacy program. Students create artwork inspired by the stories of the company’s two summer children’s theatre productions and one illustration for each production is selected to appear on the cover of the show program.